Last night as the sun set I was out taking pictures every few minutes to catch the deepening colors in the sky. Usually I focus on the oak tree in the foreground, but last night the palms in a golden sunset stole the show. 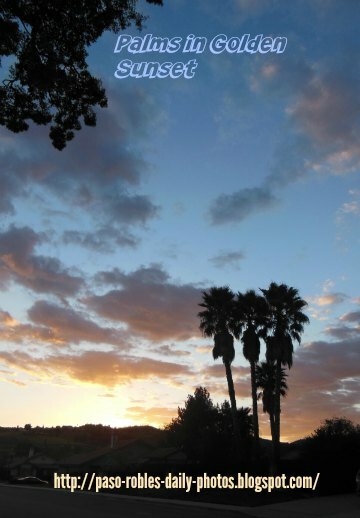 Palm trees are very common on the California Central Coast and south down to the Mexican border. Most people expect to see the palm trees in postcards of California beach towns and near the beach itself. 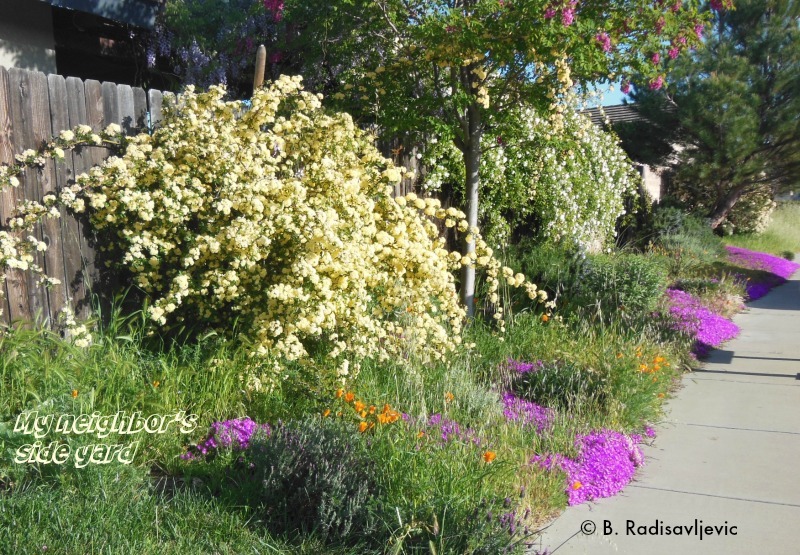 They are also used in home landscaping and to line residential city streets in cities like Long Beach. 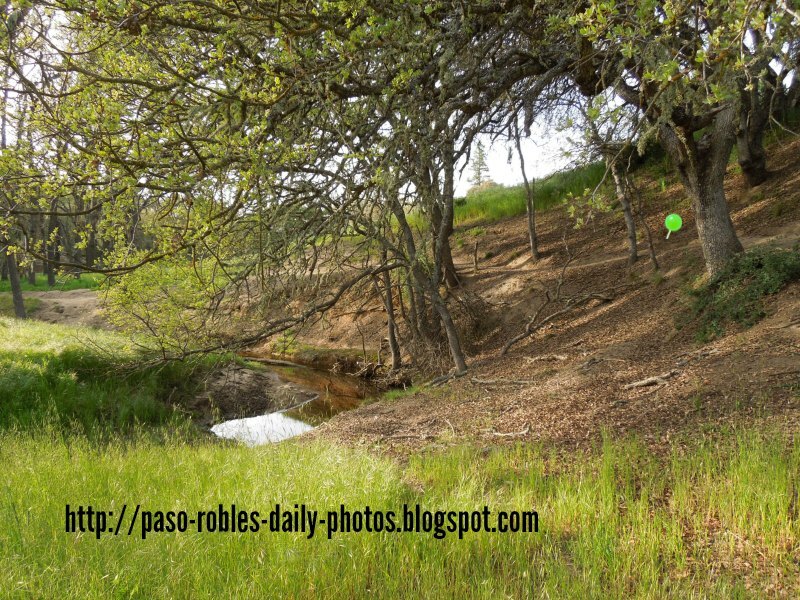 As you can see in these photos, we also have some in my Paso Robles neighborhood. 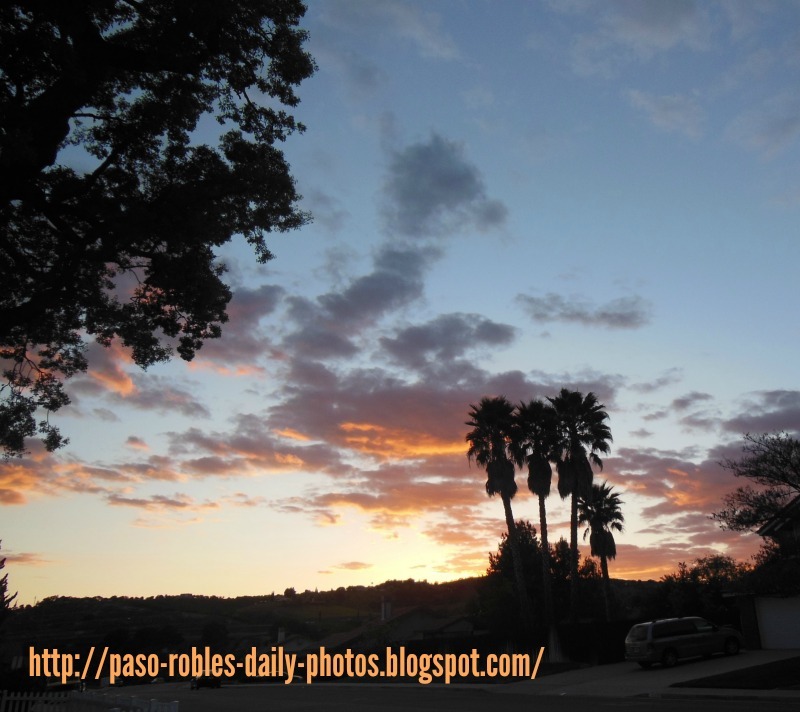 I feel pretty lucky to get to choose between focusing on the oak tree and the palms in my photos at sundown. Last night I captured a bit of both of them. Do you prefer the palms or the oak trees in your landscapes? I was amazed to see so many products on amazon related to palm trees. I discovered not only books on the different varieties and how to grow palms, but also palm party favors, inflatable palms for parties, artificial palm trees in pots for interior decorating, and much more -- all on the page you each if you follow that link. Zazzle also has designers that feature palm trees on their products. You can find more palm tree designs here. Most of us have read the Emerson quote, "Earth laughs in flowers." Many people may associate it with the coming of spring. I confess it certainly expresses what I feel when barren vines, trees, and shrubs suddenly burst into bloom, the irises and other bulbs emerge, and ground that was empty becomes alive with new seedlings that soon flower. When the earth seems almost dead, it suddenly explodes into a mass of color below our feet and above our heads. "Earth laughs in flowers" is just part of the poem "Hamatreya" by Ralph Waldo Emerson. Here is the quote in context, although there is a similar theme in the rest of the poem I've not quoted. Hay, corn, roots, hemp, flax, apples, wool, and wood. Saying, “’Tis mine, my children’s and my name’s. As Karen Joslin states in her blog post on this poem, the quote is often taken out of context. It is not a joyous tribute to spring, but rather a statement of man's arrogance in thinking he is dominant over nature. I would prefer to say that although God gave humankind dominion over the earth in the sense of using it and caring for it, humans do not outlast the earth. As the Bible states, they came from the earth and will return to it, and no man can prevent that. 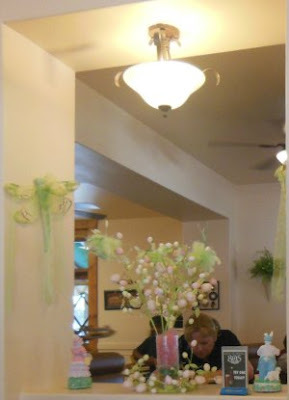 Vicki Lane states in her blog on this quote that perhaps the flowers we see at funerals are "earth's last laugh." I prefer to think flowers are God's gifts to make our sojourn here more pleasant or to reward those who worked hard to plant and care for them. The flowers in these photos were taken of my neighbor's side yard. It's beside the mailbox when I go to get my mail. I have seen her working hard to care for her plants year round. I'm sure she must feel rewarded for that work as she sees the results now. The photo above showed one of my favorite parts of this garden by the sidewalk. The one below covers more of the garden in less detail. The orange flowers are poppies, the purple are iceplant. As far as I can tell, the masses of flowers on the fence are roses or rose relatives. 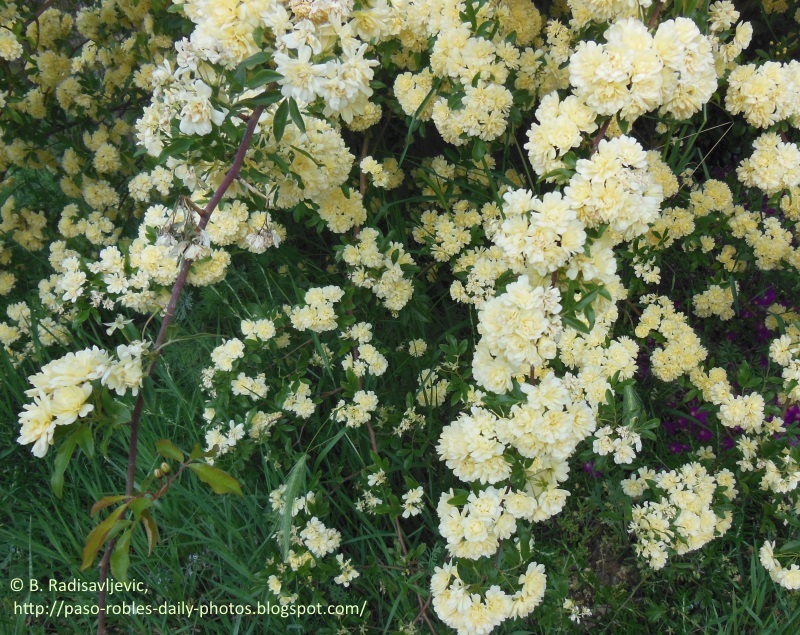 The pale yellow ones smell like roses but they are in small clumps of several small flowers. I put a closer look at just those flowers below. The white ones spilling over the fence are definitely roses. What do you think? Are flowers meant as joy for our journey, a reward for our gardening labors, or "earth's last laugh"? 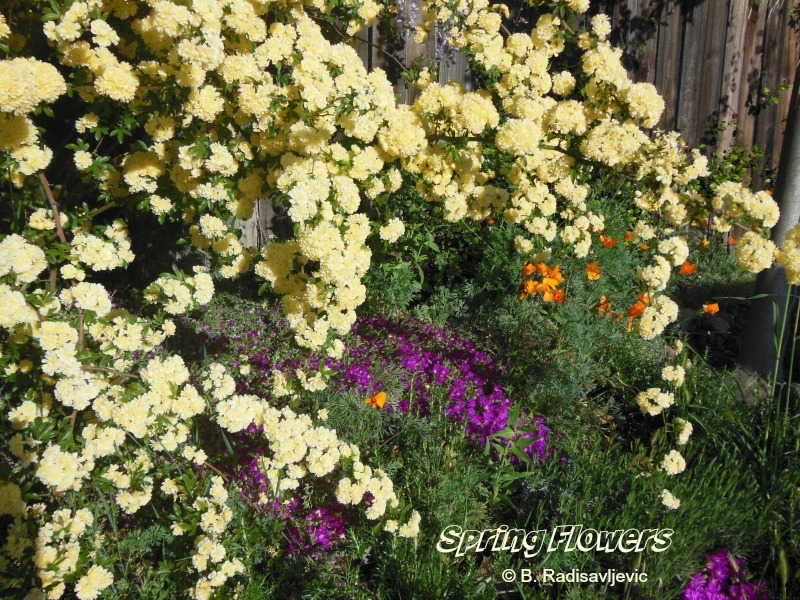 I have put many of my flower photos on blank greeting cards you can see in this Zazzle floral card collection. One of the cards shows a scene from the garden in the photos above. 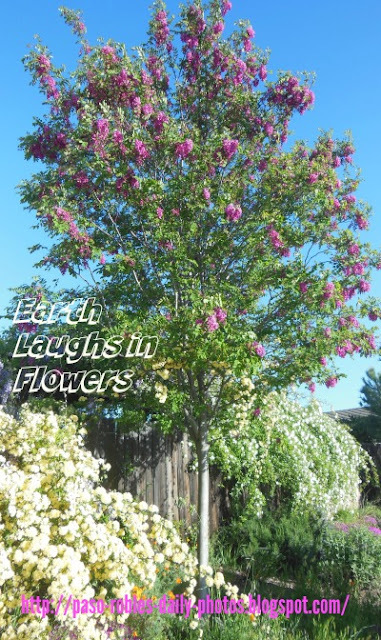 Here is a sampling of products that use the quote: "Earth laughs in flowers." most designs have been placed on many different products which you will see if you click through. I love lupine. I used to have a lot of it on my Templeton property. The drought killed most of it up on the hill when there was no rain. The seeds I planted in my herb garden rarely grew. 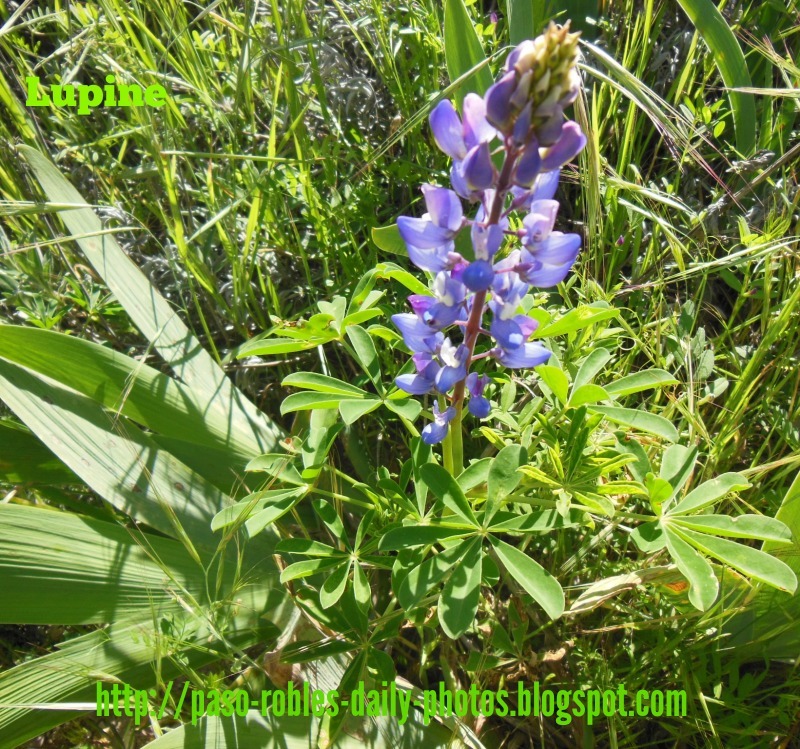 It's been years since lupine was there, even though the seeds for it have been in the ground. Today I went home, and although the property, including the herb garden was overrun with weeds, I saw lupine finally blooming again. I love surprises like that. Here's a closer look at the photo above. Lupine supposedly is a perennial plant, though I always considered this form of it annual. I've seen a shrub form in Cambria at Moonstone beach that I'm sure was perennial because it's always there. 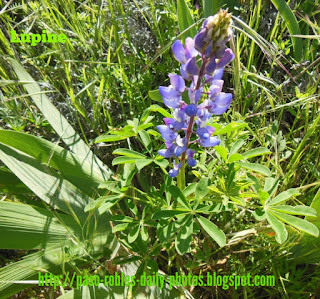 There are at least 82 species of lupine in California. All species are related to the pea, but the seeds are toxic. The plant's name Lupinus spp. means "wolf" because it was thought that lupine depleted nutrients from the soil. Instead, though, like other legumes, their root nodules add nitrogen to the soil that it needs. The photo to the right shows a bit more of the overgrown garden on a slope. Behind the lupine, to the left of the title, is an overgrown clump of thyme I need to harvest and dry. It's already blooming, but it's flowers are too tiny to see in this photo. The lupine chose to emerge among the irises that have not bloomed yet. The large lavender, oregano, and sage plants are out of sight in this photo. The lupine plants you see here came from seeds I collected one day from a vacant lot in San Luis Obispo while I was on a walk. The pods were ready to explode, and the timing was perfect. They have bloomed a couple of times before in wet years, and it's a joy to have them back this year. 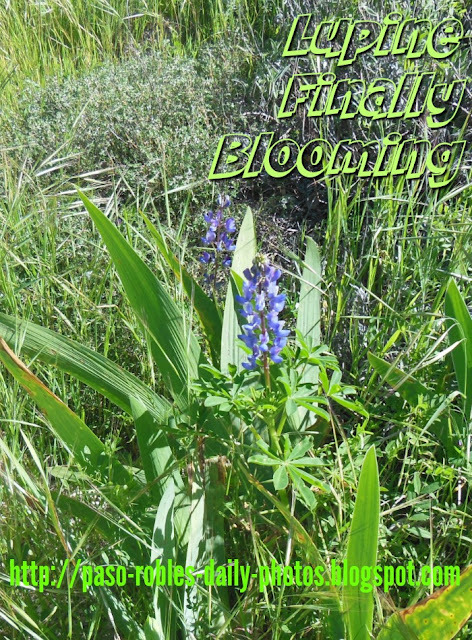 Lupine and other wildflowers don't have a long blooming season. Wouldn't it be nice to enjoy seeing them in your home all year round? Why not pick and press some while they are in bloom? Here are some how-to and craft idea books, and even a microwave flower press you can browse through at Amazon if you like to do things yourself. If you don't have time to make something lovely with wildflowers yourself, why not buy some of this lupine wall art for one of your walls? Here are some beauties from Zazzle. The California Weeds You Need to Pull Now! 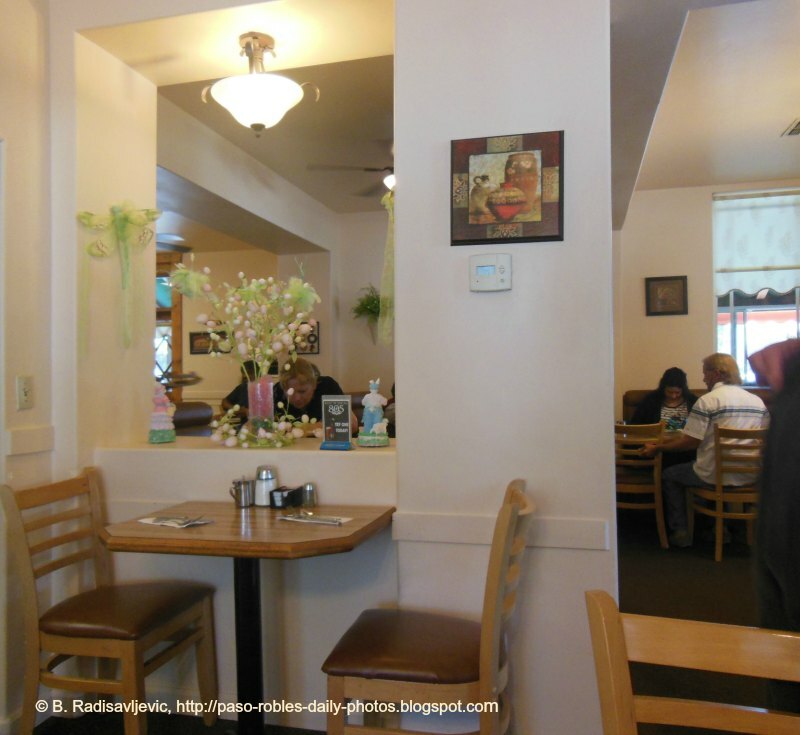 It seems to be strange not to be with family in someone's home on Easter Sunday, but our extended family extends between Riverside, Fresno, and Tustin, all of which are a long drive from the Central Coast. Still, it just didn't feel right to just go home after church. That would be kind of a letdown. So we drove by Touch of Paso to see how busy the parking lot was and we were lucky. It appears an earlier after church crowd had left and we got in before the second wave got there. The food was tasty and the restaurant was decorated for Easter. I always enjoy it more quiet than crowded. In spite of staying near home, it was still a day of communicating with family. My husband and I talked for a couple of hours, and my brother called and we must have talked to each other for close to an hour. This has been the first conversation we've had in a long time where we didn't talk politics, but about family. It is a refreshing change. There will always be some sort of politics, but one never knows how long one's family members will still be around. How did you spend Easter Sunday? 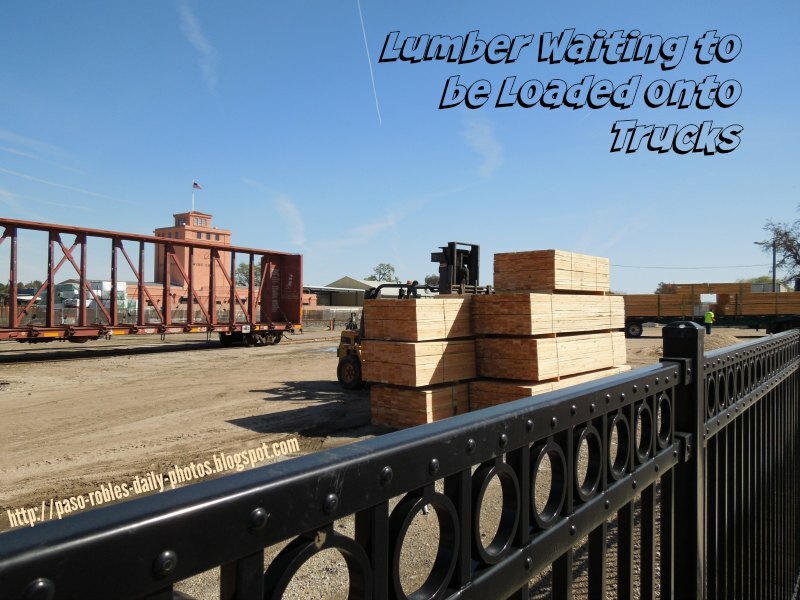 I had never known I'd want to watch a forklift reach truck load a lumber truck until I heard the forklift in the distance as I walked near the Paso Robles Train Station toward Derby Wine Estates. My curiosity kept me walking east beside the railroad tracks until I found the source of the engines and beeping. At first I wasn't sure what I was seeing, since by the time I got there the action had temporarily stopped. 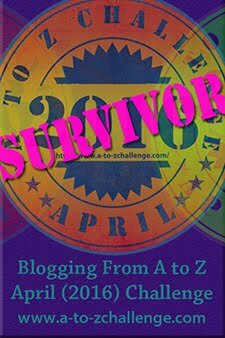 I actually discovered I knew less about what I was seeing than my son would have known when he was fourteen years old. He knew the names of all the construction vehicles and what each one did. He used to go watch anything having to do with construction or vehicles. I, on the other hand, had to whip out my Facts on File Visual Dictionary to understand what I was seeing. That dictionary is now out of print, but has been replaced with a later edition by the same author, Jean-Claude Corbeil, now known as Merriam-Webster's Visual Dictionary. The wonderful thing about this dictionary is that you don't have to know the name of what you are looking for. You just find the subject. 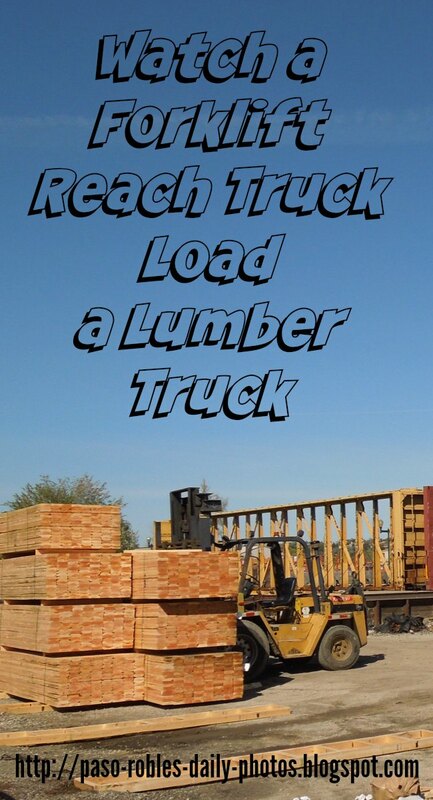 I was able to find the proper name for the forklift reach truck under Heavy Machinery, Materials Handling. Then the clearly labeled illustrations helped me identify my vehicles. Since a video is worth many words of explanation, I did record video of what I saw to share with you, so you, too, can watch how a lumber truck is loaded and sent on its way to a lumberyard. I did narrate what may not have been clear. Be sure to invite and curious children to watch this with you. You might want to watch it full screen. It's been two days since my wildflower walk on the Snead/Rambouillet Trail, and I'm wondering if this part of the walk contributed to my emergency room visit yesterday. I had been trying to figure out how to cross the creek. 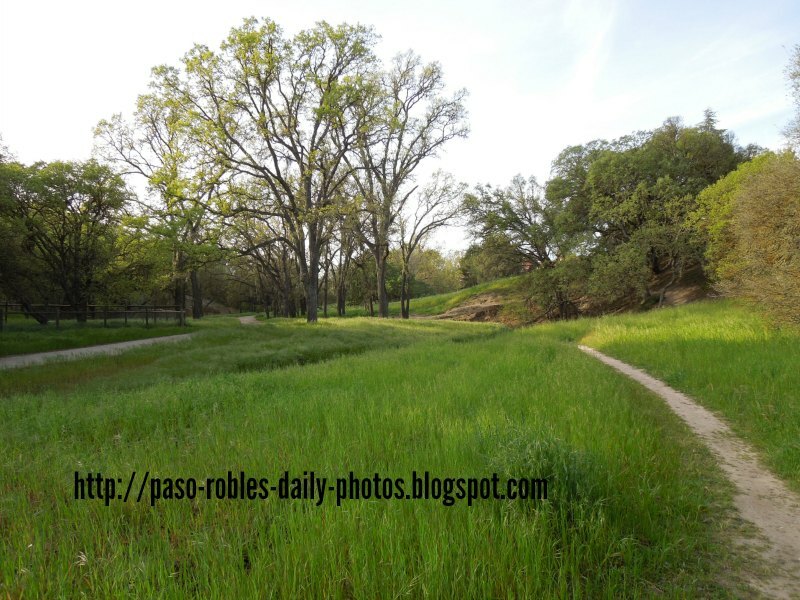 The trail is more like a series of small trails emanating from the housing developments which surround the open space in the middle between them. I always enter from Oxen Street on a paved path with low stairs built in. A narrow dirt path parallels this. After taking the path or the stairs down the hill, I come to a creek. 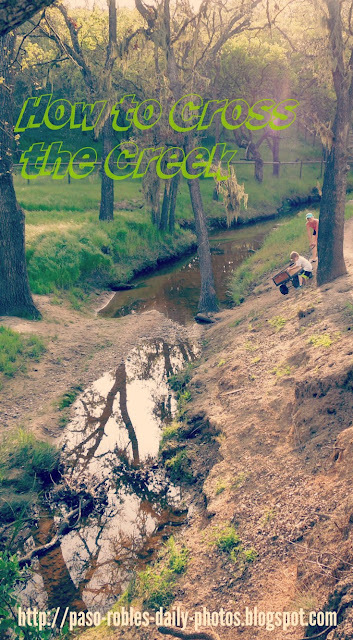 From the main path there is a wooden bridge that crosses the creek. From that main path, I could see a creek on my left. I decided to take the paved path to the other path I thought connected to it, but instead I was blocked by the creek. 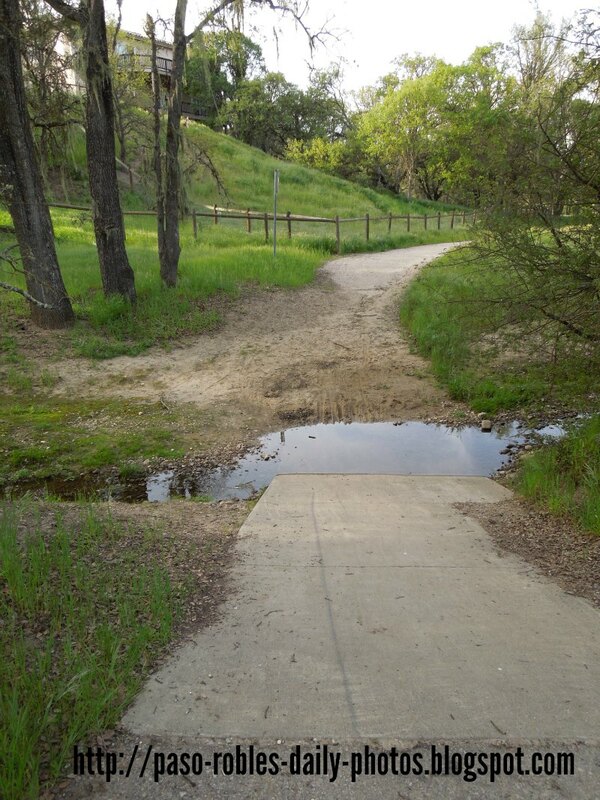 Since I wasn't wearing boots, I took the path back in the direction I usually take it until I reached the turn-off to a dirt path that I believed would meet the other path I wanted up near a pond. It's the path to the right in this photo. You can see the path I want to be on to the left. The dirt path became quite steep and narrow where it follows the curve of the creek. You can see how the path leans in a slope between the trees. I have pointed to the path with the green pin. I wanted to get to where I thought I could get on the path I wanted, so I stayed on the dirt path even though I knew the slope and loose rocks were risky for me. Since I saw the woman and her children ahead of me, I knew help would be close should I slip. I figured I'd come back by the wider level path once I was across the creek. But that didn't happen. The path again dead-ended into the creek. There was only one place to cross the creek without getting wet. Unfortunately, I didn't want to risk the slope it would take to get to it. I was between two steep places, but I chose to go back the way I came. 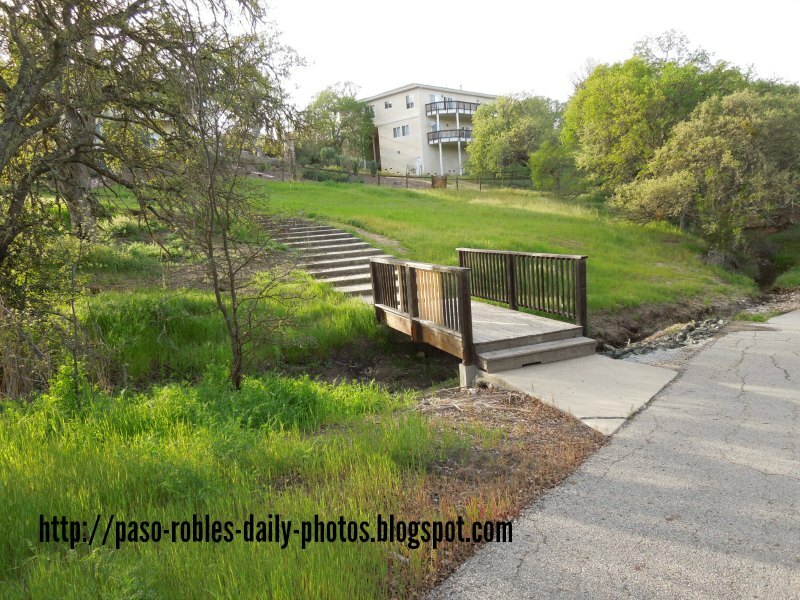 As I expressed my opinion about the lack of bridges to cross the creek from the paths, the mother explained that the golf course used to be very close to where we were walking before there was so much development around the open space. That's why the trails have no bridges across the creek. 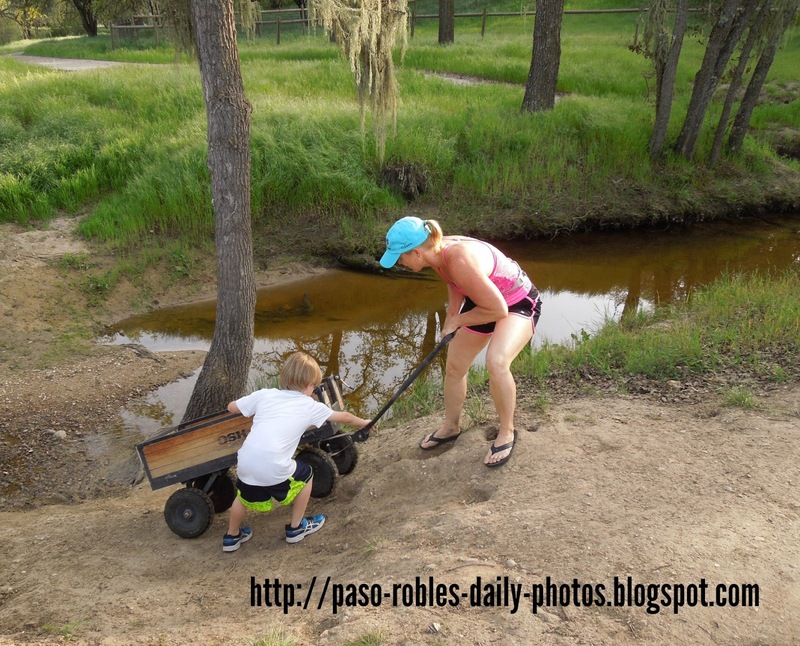 People used golf carts to cross the creeks where the trails stopped. Those on bikes still have no problem getting across the creeks. After I left the the trail and went back to my car, I continued on to shop for groceries before going home. My back began to hurt just after I made it into the house with the bags of groceries. I can't help but think it was the effort to keep from slipping on the slope that caused my back to go into a spasm. Fortunately the medications they gave me at the emergency room yesterday are helping and I'm almost back to normal just before midnight tonight. I think I've learned I need to be more careful.